The residents of the city say there are only three places worth visiting in Amritsar: the Sikh Golden Temple, Jallianwalla Bagh where the British Brigadier Dyer in 1919 massacred unarmed Indians ---and the Wagah border. 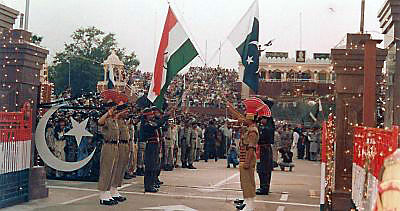 Indeed the flag-lowering ceremony at the end of each day on the India-Pakistan border at Wagah in Punjab has over the years become a tourist destination, attracting predominantly Indians and Pakistanis on the respective sides of the border, with a sprinkling of foreigners. 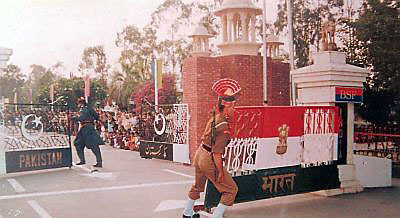 The Wagah check-point is about mid-way between the cities of Lahore in Pakistan and Amritsar in India, each about 25 kilometers away, on the only road link between the two neighbours. Here the border is marked in white as it cuts across the historic Grand Trunk Road (GTR). 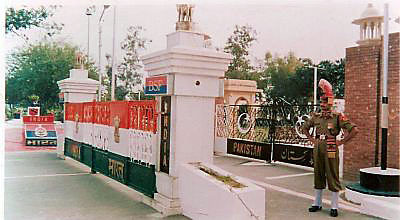 The road has been closed for years now at Wagah by two metal gates, one on each country�s side. The two flag posts are located contiguous to the boundary line between the two gates. 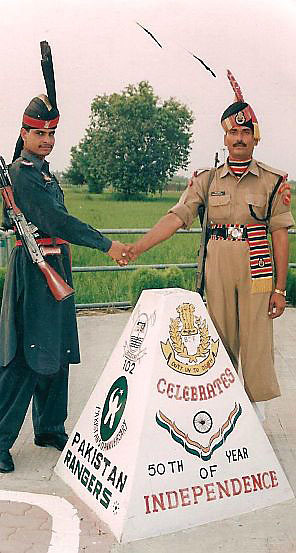 Traditionally the flag-lowering ceremony has been a display of macho and mutual hatred by the border security forces on each side, though the animosity has been toned down in recent years. 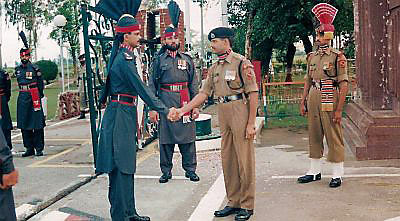 As the guards muster on each side and the crowds on both sides wave their respective flags, the air resonates with nationalistic slogans, including �Pakistan Jindabad (�Long Live Pakistan�) and �Jai Hind (�Long Live India�).On the Pakistani side, there is also the intermittent playing of Koranic verses . Then, at the appointed time, both gates are thrown open, the border troops take giant exaggerated steps towards the flag posts and stamp the ground vigorously with their boots. Their demeanor and facial expressions signify determination, defiance, even hostility. After the flag lowering, the two gates are shut with a loud clang, as if to signify a determination that each country will remain shut to the other. A South Korean visitor on the Pakistan side of the border last year could barely contain his amusement over what, to him, looked like a farce. In his derisory merriment he forgot that it was perhaps no more farcical than the face-off between South Korean and North Korean troops at the Panmunjom on the 38th parallel border between the two countries. Among the Indian and Pakistani crowds the ceremony seems to arouse tangled emotions, a mix of sadness, hostility, curiosity and perhaps a yearning to connect. I observed the hostility and tragic pathos last year on the Pakistani side: an old man with a white beard was trotting up an down the thirty metres of GTR enclosed by the public stands, shouting slogans and waving a Pakistani flag. I was told he was eighty, lived nearby, had lost two sons in wars with India, and performs this demonstration everyday during the flag lowering ceremony. But there are those who have seen enough of politics and wars and are immensely saddened by the futility of sustaining such hatred. After all, the flat landscape, the rolling brown wheat fields of April, broken by occasional clumps of trees, were identical on both sides of the border ; the people, though of different faiths are the same too; and the birds flew freely from one side to the other oblivious of the man-made barriers and the grotesque displays of physical and psychological divisions. At the end of the ceremony each day, the crowds on both sides flock near the boundary fence and peer intently and curiously at the other side. What unspoken emotions, what forces in the conscious and the subconscious propel them to do so? The Indian province of Punjab, which Senior Minister Goh Chok Tong visited recently, is India�s richest province, but it is only a small fraction of the pre-partition Punjab. It was then a land of five rivers and stretched from Delhi to Peshawar on the northwest frontier of today�s Pakistan. The present Indian Punjab, with a population of about 25 million, emerged from two partitions: between Pakistan and India in 1947, and, in 1966, a partition of the Indian Punjab into the three provinces of Punjab, Haryana and Himachal Pradesh as a result of Sikh demands for a Punjabi-speaking province. I n view of the thaw in relations between India and Pakistan in recent years, there are hopes that border might be opened up and there can be people-to-people and business-to-business links with Pakistani Punjab. The revival of the forces of democratization in Pakistan further encourages such hopes. When that does materialize, the absurdities of Wagah will be relegated to the dustbin of history. Common sense, together with the sense of a common Punjabi identity, could contribute to the breaking of barriers between India and Pakistan at this epicenter of the divide between the two countries. Daljit Singh is a Visiting Senior Research Fellow at the Institute of Southeast Asian Studies.